Crackle/shatter top coats have been doing the rounds ever since Barry M released the Instant Nail Effects last year and after everyone got bored of the bog standard matte black version, it was only natural that we were going to get other colours. Within the next month or so, we will see more crackle top coats from Barry M, Models Own, OPI, Nails Inc which will all add to the present line up of colour crackles from China Glaze. It's not very gold, is it? I knew as soon as I saw the nail polish on display that it wasn't going to be a nice shiny gold crackle top coat but still held out some hope that once I got it home something magical would happen. I was wrong. This is the Crackle Top Coat layered on Orly 'Coquette Cutie' (click HERE for swatch) and it did absolutely nothing to the shade to make it look more special. It just looks dead. Excuse the shoddy job that I did, I was in a bit of a hurry! Upon closer look you can see that there really is no life to the colour at all. This may be because the colour is too pale for gold or too dark for silver but it's an in-between shade that I have no interest in. Another problem I have with this product is that the crackle effect isn't really that great either which makes me think that there is something missing in the formulation. The Barry M Instant Nail Effects, as ugly as looks, still crackled/shattered in such a way that it was quite facinating to watch. This, on the other hand, is like watching paint dry (literally!!). It took a good few minutes before I saw any action on my nails and the shatter is quite close together so there is very little of the base coat peeking out. With that being said, I do like the consistency of this product as opposed to the Barry M Instant Nail Effects as I found that the latter went all gloopy after a couple of uses. The smoother consistency of this product may be a reason for the close together shatter but I can't imagine it going to sludge after a couple of uses. Not that I plan on using it a couple of times after this. 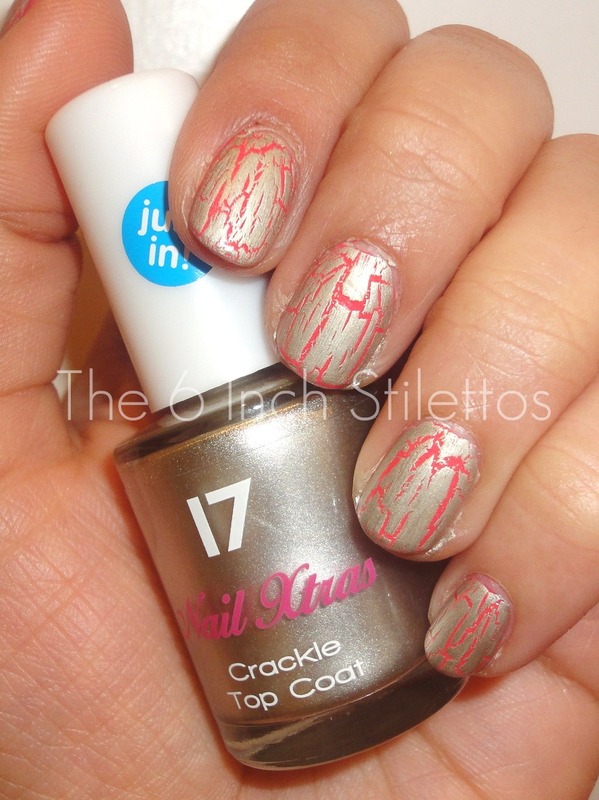 The 17 Crackle Top Coat is priced at £3.99 and available now from Boots stores nationwide. How many of you are going to buy the 17 Crackle Top Coat or are you just going to wait to see the offerings from other brands first? Answers on a postcard please! i actually quite like this! Lily Lipstick: I think you might be better off with the Barry M one.. Although, the consistency of that is really thick and gloopy so I'm hoping that they've reformulated them for their colour crackle collection. CommunicatingBeauty: I guess different folks for different strokes.. I'm going to try it again on top of a darker shade so we'll see how it works then. Will keep you posted! Too bad the color isn't very special. It does look like it did a good job at the whole "crackling" thing though :) It would be good in a different color. I recently got the Barry M crackle polish and the consistancy was extremely runny. Im quite surprised to hear it is gloopy for other people. I will wait the coloring is so dull on this.